In 1975, a Hungarian psychologist named Mihaly Csikszentmihalyi (try pronouncing that one out loud) coined the term 'flow', referring to a state of mind in which one becomes so enchanted or focused on something that all sense of space and time outside of that focus point essentially seems to disappear. The state of flow is something to be strived for, and it can be found in virtually any circumstance once certain parameters are met, and this includes video games. 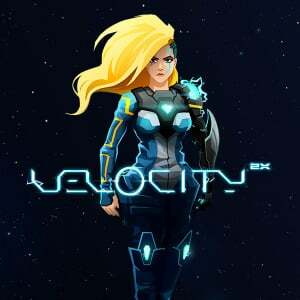 If ever there were a game that embodies the concept of flow and could most reliably put a player into that state, it would be Velocity 2X, an enormously enjoyable arcade action title that absolutely seizes your attention and doesn’t let it go. Velocity 2X puts you in control of Lt. Kai Tana, the strong-willed pilot of an experimental flying weapon called the Quarp Jet. After the final events in Velocity, which saw our brave heroine flying her jet into the heart of a black hole, Kai’s body has been partially replaced with bionic enhancements by her ship’s medical AI, and she finds herself in a strange galaxy ruled over by a cruel race of alien beings called the Vokh. Spurred on by a newfound friend and the desire to return to Earth, Kai embarks on a new adventure to discover the extent of her cybernetic abilities and help free a benevolent alien race from the iron fist of the Vokh. Although the plot isn’t exactly what we would describe as riveting, Kai’s journey nonetheless manages to entertain and occasionally hit on some emotional notes, providing a fitting context to the lightning-fast arcade action. Right from the off, Velocity 2X makes it clear that this is an experience that’s designed to be all killer, no filler; from stem to stern, the campaign will push your dexterity to its very limits by demanding absolute precision and adaptability as it throws chaotic and high-intensity action at you. 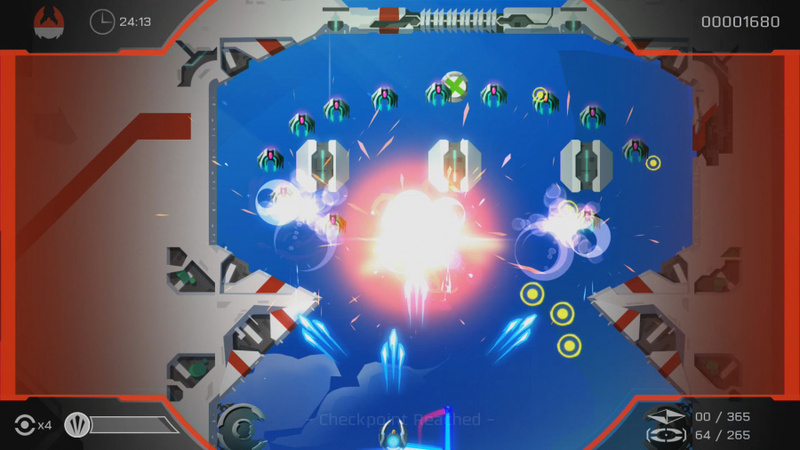 The majority of gameplay will see you taking control of the Quarp Jet, blasting enemies and smashing through glass with bombs and lasers while utilizing warp technology to jump around the map. Occasionally, the way forward will demand that you disembark, placing you in control of Kai in action sidescroller segments that see you dashing through all manner of traps and enemies in a desperate race to find a switch that will open the way for your jet. 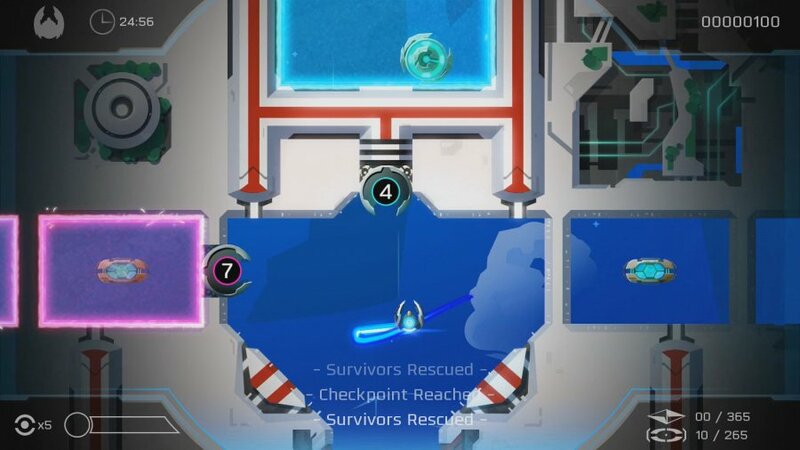 It may sound like a ho-hum action game so far, but where Velocity 2X shows its brilliance is in how the entire campaign is a dozen(ish) hour long tutorial on how to play the game right. Every few levels, a new concept or ability will be introduced, like a throwable warp pod or a directional bomb attack, and the next few levels will expand on it and show you various places the new concept can be taken. After several dozen levels, you’ll have built up quite a repertoire of moves and obstacles to overcome, and the things that you've learned earliest will become second nature. Velocity 2X excels in the art of passive teaching; of drilling things into the player over and over without them fully realizing it as it shapes you into the kind of player that you need to be. The point of all this training, of course, is speedrunning, which is the bread and butter of Velocity 2X. New stages are unlocked based on how well you perform in previous stages, so if you wish to see everything this game has to offer, you’ll have to perfectly clear every stage. This means that you must make it to the end of every stage having killed every enemy and collected every collectable while moving at a full sprint, without dying. Early stages ease you into this, with generous time limits and simple obstacles to overcome, but it doesn’t take long for the difficulty to ramp up considerably and demand fast reflexes and raw muscle memory to succeed. Should you fail - and you certainly will many times when trying to perfect a level - respawning is almost immediate, and you can even restart a run with a simple tap of both shoulder buttons. The reason why this speedrunning approach works so well, and why Velocity 2X can be so infuriatingly difficult to put down, is because of how each level is designed to be in perfect harmony with your abilities. 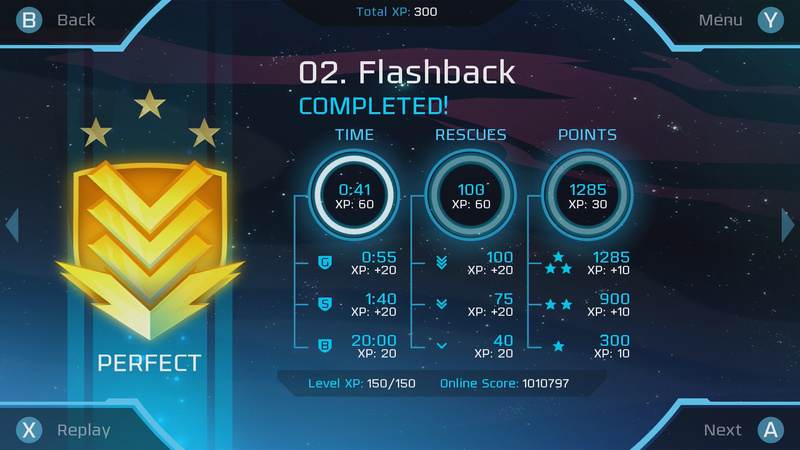 On your first playthrough, Velocity 2X seems like just an average action game, but coming at it with a full loadout of moves and several hours of experience shows it for the painstakingly fine-tuned experience that it is. Every enemy, jump, and obstacle is placed precisely where it is for a purpose, pointing the way towards a single, optimal path towards clearing a stage with flying colours. In a way, Velocity 2X becomes a sort of rhythm game once you reach the point where this is evident, as individual elements melt away and you go into a Zen-like state of naturally reacting to everything that’s thrown at you. It becomes a game of building and maintaining momentum, of playing stages repeatedly to learn from every mistake and finally clinch that perfect run. Those of you that are looking for replayability will be pleased to know that there’s plenty to keep you coming back, such as online leaderboards that show how you stack up compared to friends and other players in the world. On top of this, there’s a slew of unlockable content, such as concept art, daily challenge runs, and all the previous paid DLC included free of charge. Though Velocity 2X may not appeal to everyone, this is certainly a game that offers up significant bang for your buck. 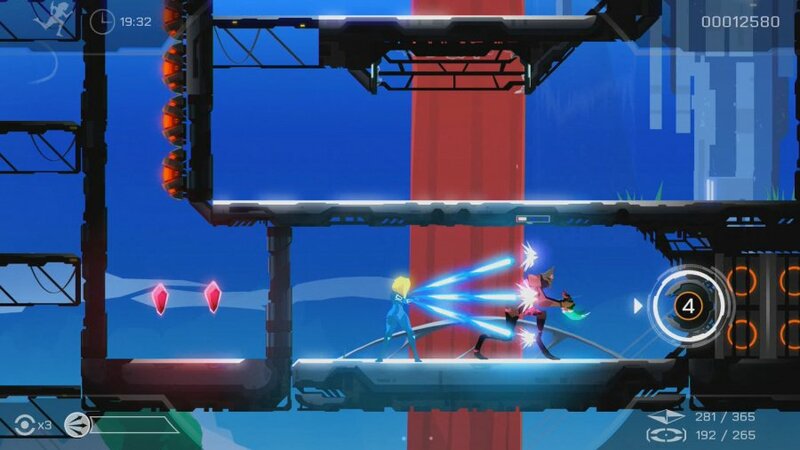 To match the intensity of the gameplay, Velocity 2X features a stylish, comic book-like art style that focuses on strong colour contrasts and bold, straight lines. When in motion, it makes the game look like concept art that has jumped straight off the page; there’s a certain raw and functional aesthetic about it that feels like the perfect way to portray this sort of gameplay. This is supplemented, too, by smart use of HD rumble, which does a great job of helping you to feel the action in big and small ways; it may not be the best use of Nintendo’s curious tech that we’ve seen, but it’s certainly a cut above many other games’ implementation of it. All of this is backed by a stellar soundtrack of electronic music which pulls from a variety of subgenres to provide a diverse experience to suit multiple moods. For every fast-paced, high-BPM track that plays during 'Critical Urgency' levels, there’s an equally chill and atmospheric track for the more relaxed conversations happening in the cutscenes between levels. We’d recommend you pull out the headphones for this soundtrack, as there are certain nuances to the music that you might miss while playing on the TV, and it helps that much more in immersing you in the action. WOW! DOUBLE SOLD! Sounds amazing! Great review. Velocity 2X is my fourth favorite game of all time behind Mario Galaxy, Uncharted 2, and Wind Waker. I have to confess that the switched up control scheme is interrupting my personal flow with the early levels, but the new scheme makes sense, and shouldn't be a problem unless you've spent dozens of hours with this game on another platform. The new scheme is starting to click for me, but I occasionally go back to the old layout (attempting to warp with Y instead of ZL being the most common). Glad you guys reviewed it in a timely fashion. In the process of mastering these levels (and this is really a game where you will want to master each of the levels), one struggles through a period of stress before achieving a sort of zen harmony that allows you blow through obstacles and with reaction times that seemed impossible previously. And, yes, the level design is brilliant. I prefer the simplistic perfection of Velocity Ultra overall, but 2X is still masterful, and I really hope it sells well. Well, I asked for a good review before I would buy this and here we are. Sold. Oh man I played this a looooooooooooooooooooooooong time ago. I agree with this score it's definitely a good game. Oh man, this game just sounds better and better. Will definitely pick it up soon. This one looks good. So is Velocity 2X the original game or the sequel that the dev is promising to make if this one sells well? Also, "Quarp Jet" sounds like something you experience after eating at Chipolte. Thank you! Good night! This game rules. I played the heck out of it on Vita. NintendoLife is like the Oprah of positive reviews. @BigKing Metascore of 90% on the Vita version. Looks like everyone gave it a 9! Haha. "In an age where indie titles are becoming increasingly more reliant on procedural generation to do all the heavy lifting, it can be immensely satisfying to play a game that is tailor made for one specific experience." In full agreement. It's not a deep experience but it's one that does a job and does it well, while not being plagued with randomness. @BigKing yeh just ignore all the other sites who scored the game highly. Nine out of ten. Just as good as Hollow Knight then? Pfft... What are you doing to me, eShop? This looks awesome but I doubt I'd have the patience. Hopefully a demo will come for it. @DrJiggle Velocity 2X is a sequel to Velocity and its updated version Velocity Ultra. Everything you need to know from the previous game is recapped in the opening stages of 2X. The sequel that FuturLab wants to make is called / working-titled Velocity Supernova. I'll be snapping it up today - it has a 20% discount for its first week, btw. 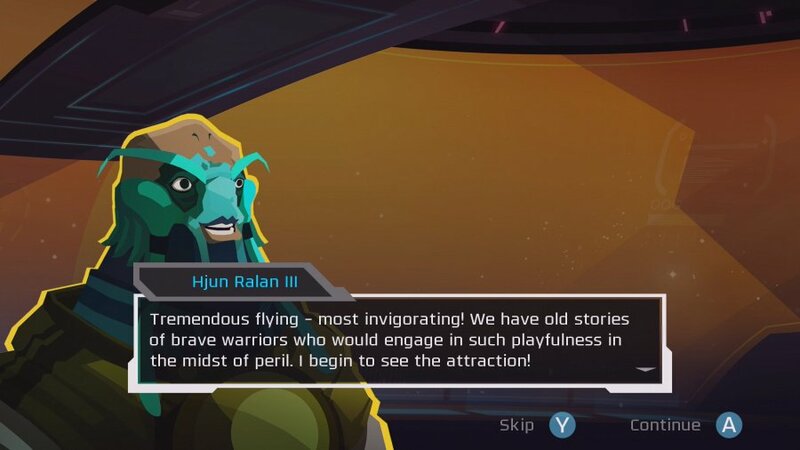 I could probably blag a code (disclaimer: I worked on 2X for a short while), but I really want to see FuturLab make the sequel they've had in mind for years, so I'll happily... crikey... quadruple dip on this one. That's why I don't take gaming 'journalism' seriously. They are just fanboys. It's still a 4 year old indie title that was in a humble bundle a few years ago. get outta here, most of these are year old rehashed of games that were less than $5 on most other platforms. @ThatGiloFella Thanks for the recap! It was very helpful. Will definitely pick this one up, on sale. @BigKing Awesome comment. 9/10. I didn't make the connection that the recent slate of reviews were all re-releases of games that have been available on other platforms for much less money, for years. Not every game can be just one degree shy of perfection. @BigKing so what you are saying is we should all ignore game journalism reviews as according to you they are fanboys. Guessing you instead want us to take your opinions as gospel instead. Also how does a game being old and released for cheap on other platforms drop the quality of the title. Velocity 2X hasn't become a worse game now it has been released on a nintendo platform. @kobashi100 What I say is that if so many games score a 90(in one month!) that means that is the new 70 and scores should be adjusted accordingly. And yes, if games get re-released years later I expect improvements. Or how about a sequel? That isn't unreasonable. Re-releasing for full price is lazy. They had four years to create some new levels and justify a higher price tag. A 90 should be used to indicate that a game is head and shoulders above everything else. It should be in must-buy territory, potential classics that will be remembered for years. There can't be 13 must-buys in one month. It's not like this is the greatest month in video game history or even for the Switch. I am not saying that this is a bad game, I say that I am not sure if it's really great because everything gets a 90 on this site. It makes it hard to pick out the gems. Ah so everyone else is a fanboy, but you, being the genius you are, have seen through the hype? I had no intention of buying this game but something told me to give it a shot. I just started it but I'm SUPER glad I gave it a shot! Hoping a third game is on the horizon and would also like the first game to make it onto the Switch as well.